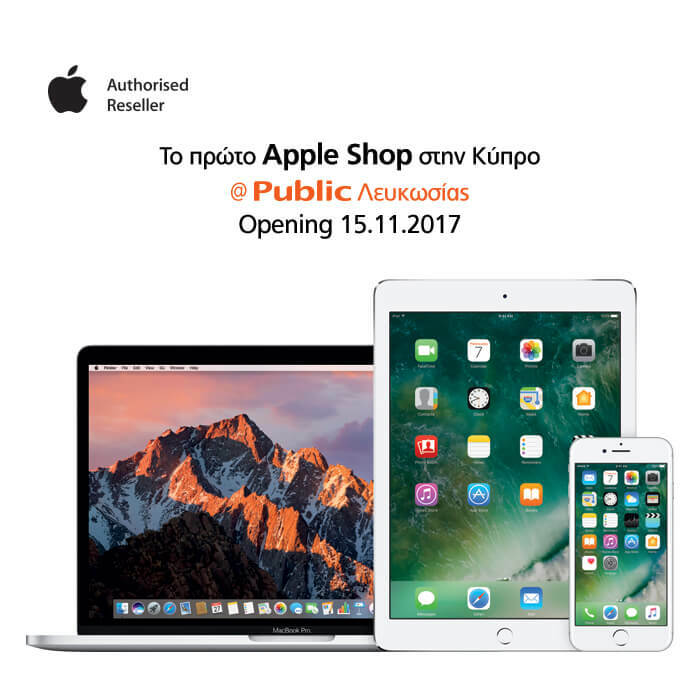 Public announces the opening of the first authentic Apple Shop in Cyprus, in our store in Nicosia. Public Nicosia’s Apple Shop grand opening will take place on Wednesday 15th of November at 10 am with special Apple offers and many surprises. Apple Shop finds its place in our store at The Mall of Cyprus, as a shop-in-a-shop solution, occupying a space of 50sqm. Our Apple Shop is designed by Apple in order to provide a full, authentic and unique customer experience. Furthermore, a sales consultant will be at our customers’ disposal at all times, trained by Apple standards in order to offer clients a personalized assistance and making sure that his needs are met, before and after the purchase. Within the Apple Shop our customers will have the opportunity of trying out the new iPhone lineup, iPhone X and iPhone 8, as well as all of the other popular Apple products, within a carefully designed space.